It was about nine am. The scene looked eerily similar to other ones I’ve seen. White feathers mingled with old hay and dust on the barn floor, a sure sign of an attack. Chickens are locked up at night to prevent this from happening, but somewhere along the line this hen had decided to leave the safety of the hen house and raise a clutch of her own without the added safety. We didn’t even realize that she had a nest elsewhere until it was too late. Something had carried off the hen, leaving nothing behind but a few wisps of white. It looked like the barn cats had gotten the chicks. Sunday was shaping up to be a bad day. It hadn’t been a raccoon, because the hen had been taken. It almost had to be a fox, but she had been on the floor in the same stall as the barn dog. How did a fox get in? WTF, Milk Dud? Worst barn dog ever. Captain America, my dad, and I pondered this as we searched in vain for more clues, or maybe an injured hen. It was then that I noticed the sound, niggling on my nerves. Was it a barn swallow? Did they have chicks yet? But no, it was the insistent peeping of a chick in a horse feeder, across the barn from the massacre. Had she hatched the chicks in stall seven then? Only to have a few leave the nest and she flee the safety to protect them in stall two? It seemed to be so. I wound my fingers around the tiny balls of yellow fluff and gingerly cradled them close. One of them had already passed away, frozen to death; but one was healthy and the other wasn’t quite gone yet. I knew just what to do. “What?” She blinked at me and then started examining the golden fluff. “Okay give them here.” She promptly shoved them under her shirt. You learn quickly as a woman on a farm that the best place to revive cold newborns is in your cleavage. It doesn’t matter what they are: kittens, puppies, chicks… okay calves and foals wouldn’t really fit, but I digress. I couldn’t find the hen anywhere. It was starting to look more and more like a fox in the horse barn was our culprit. 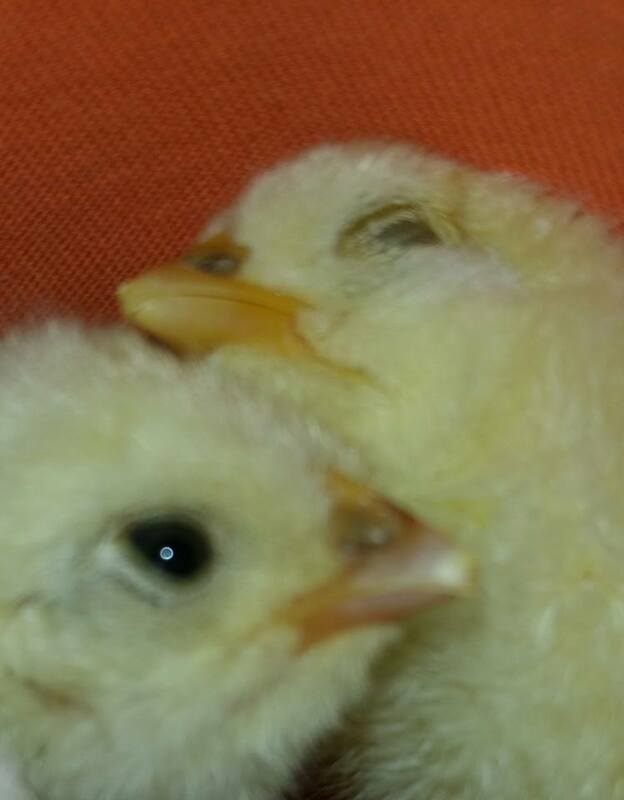 CA and I ran to the feed store for chick starter, and I fought the urge to buy another chick to keep the one little peeper company because I was pretty certain that even the power of nestling in a brassiere wouldn’t revive the other one. I got home and ran upstairs with my load of chick probiotic and feed only to find mom still in bed. “Thank God. Set up a brooder. 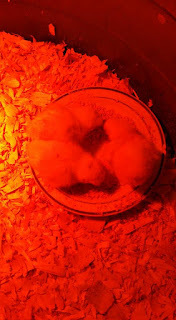 I can’t stay in bed all day!” She then pulled down her collar to show two happy little chicks curled up and warm. So, back out to the barn I went in search of a heat lamp and some sort of chick container, but what did I hear? A soft “peep, peep, peep” came from the roof of the tack room. I wrestled a ladder around and what did I find at the top? Another freaking chick. I scooped him up and ran him back inside the house. How in the hell did he wind up on top of the tack room? 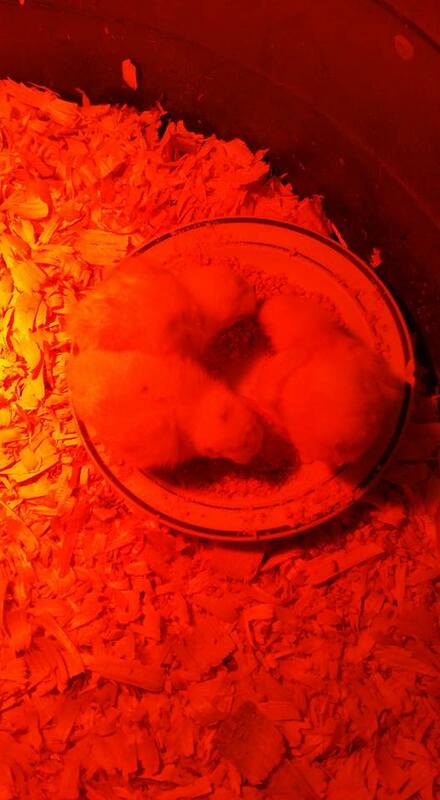 Back in the house we introduced chick three to his siblings in the mineral tub turned brooder. Mom hung the heat lamp off of her inversion table and fretted over their temperature. My tank top suggestion was turned down, again. Thinking my good deeds for the day done, I went over to the Hill to meet CA and fix the seeder that I broke two weeks ago. We even got the bonus of meeting neighbors who were four wheeling on land that they thought was theirs, which wasn’t. After finishing up with all that CA left to tend the MO farm, and I started feeding. Mom and dad offered dinner, and we ran in town. So it was almost eight pm when we got home and I was walking towards Guilty Grin with full feed bucket in hand when I hear a very faint “peep, peep, peep” coming from the wall. Yes, the wall. The SOLID WOOD WALL AT THE WHOLE OTHER END OF THE FREAKING BARN. WTF?! I ran in and grabbed a flashlight and drug the ladder down the aisle way to peer into the tiny crack between the wooden stall wall and the tin outer wall of the barn. And there was a barn swallow. I ran back in and told mom and dad that there was a bird stuck in the wall, but it would require property damage to get it out. Bless her soul, my mom looked up from her bedroom brood box and her response was to ask my dad to go out and take a look: “take the siding off, it’s falling down anyway.” Which it isn’t, except for the down spouts that I ripped off with the manure spreader while I was in high school because I have no spatial reasoning ability whatsoever. So, at 8:30 last night we were ripping the siding off a horse barn to rescue a chick trapped in the wall. Still not exactly sure how he got all the way over there. "This Old Rock," the repair show of the future.